In defense of “Chapter Fourteen: A Kiss Before Dying” and “Chapter Fifteen: Nighthawks,” those episodes were very much early setup for the rest of the season/this particular arc. In my review of “Chapter Fifteen,” I criticized the use of reset buttons as part of the setup for this season, and while those are still present in “Chapter Sixteen,” there is less of a heavy hand on the button this time around. Instead, “Chapter Sixteen” is a true return to a Riverdale that doesn’t need to handhold its audience and completely reintroduce it to the world. There is still plenty of setup, but “Chapter Sixteen” is not a setup episode above all else. It’s just Riverdale, and it’s a version of Riverdale that even does well for two of its hardest to handle characters, Archie and Kevin. Kevin Keller is a character who seems like he should be so much easier for Riverdale to grasp. In the first season, he and Veronica were often the only two characters who called attention to just how crazy things are in Riverdale. His relationship with his father was also one of the most surprisingly refreshing aspects of the show, a concept that’s thankfully still treated as important in this episode. (Let the record show that while Sheriff Keller is not the best sheriff, he’s certainly still the frontrunner for best Riverdale parent. By a country mile. Sorry, Fred.) But a combination of Gay Best Friend characterization and the naïveté in his relationship with Joaquin (as nice as the San Junipero send-off was) led to a case of diminishing returns for the character. It also didn’t help that actor Casey Cott was “only” a guest star, making a supposedly important character—as Betty’s best friend, the sheriff’s son, an openly gay but still rather respected figure in the town, even a reasonably decent contributor to mystery-solving—end up on the outskirts as a result. But now that he’s a series regular, the expectation is that he will have more on his plate. So after a few scenes sprinkled in the second season’s first couple of episodes, “Chapter Sixteen” looks like the official beginning to the righting of the particular wrongs with the character. And while it’s a bit of a bummer beginning, it is one that does what Riverdale is all about: It peels back the shadows on perceived lightness, as unpleasant as that ends up being. In this case, it comes in the form of Kevin and his new hobby of/compulsion for cruising in the woods at night. This is also how he finds the damaged-but-still-alive Moose and Midge in the woods. But while life-saving is a big deal, it’s not the focus of Kevin’s story in this episode. Kevin’s dilemma in this episode is one of those Riverdale plots that’s realer than most, but it still works effectively without needing any over-the-top bells or whistles to keep it interesting or maintain the tension. The closest the plot even gets to over-the-top is the moment when Kevin imagines the car creep stabbing him. It’s legitimately slasher film scary, but it also plays on the show’s established unsafe world, as well as the Black Hood’s (and a lot of terrible people’s) established stance against sinners. Given Riverdale’s basic dystopia status, it’s believable and a genuine relief once it turns out it was all just a dream. It is a big deal that Kevin gets away unscathed, both in an episode and season in which the writers are attempting to make clear that no one is safe and as a point that Kevin himself makes to Betty. He doesn’t have the same romantic options as her, and his high school experience—no matter how accepting the school itself is—won’t be the same as hers, no matter how much she wants to use the “we’re all in this together” argument for him. Kevin’s past two love interests have been closeted jock Moose* and gang member (with ulterior motives) Joaquin. So while Kevin reaches an emotionally cathartic moment with his father at the end of the episode, it’s probably for the best that it doesn’t erase his earlier fight with Betty. Not because she snitched but because it’s time for Riverdale to examine who Kevin really is outside his friendship with Betty. 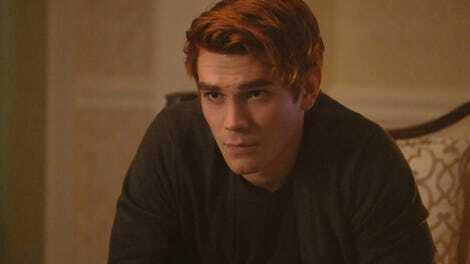 As for Archie, his PTSD and general trauma—while interesting, provided he finally admits he needs help and gets it—in “Chapter Fifteen” took on a less fun form than expected from “Chapter Fourteen.” But here in “Chapter Sixteen,” boy does it deliver. Because while there’s nothing but disappointment when it comes to Archie considering drug abuse and unintentionally making the argument for gun control, there’s nothing but sheer Riverdale-ian joy when it comes to him translating that into a teenage boy militia. A (sometimes shirtless) teenage boy militia, sponsored by Riverdale High School and encouraged by Hiram Lodge. That’s what Riverdale should be. That’s what Riverdale is. Even better is how Archie’s inner circle reacts to his new hobby: like it’s any old Archie hobby. They all treat it like it’s his new music thing, whether it’s Jughead’s amusement at his drive to do it or Veronica simply reminding Archie not to bring it up (like he would his music) at dinner with her parents. This is the same episode in which Archie tries to pretend he really did much to help solve Jason Blossom’s murder, too, so it makes sense that most characters would just hand wave his decision to be a teenage vigilante. Even when there’s a legitimate threat in and around town. Archie, a person who should not be put in charge of things. This was even the case for football. Keep in mind that he only gets the Red Circle idea because he hides his gun under his comics, with his old toys, because he is a youth. New Reggie, a person who thinks dressing like the attempted murderer of his teammate’s dad makes a good prank. He is also a legit drug dealer, so you know, is he really that concerned with cleaning up the town? Principal Weatherbee, a person who realizes this “school club” is teen vigilantism, but… that’s good for school spirit, I guess? Dilton Doiley, a literal doomsday prepper (and gun runner) who the first season made clear should also not be around kids. The Riverdale football team, who are mysoginistic at best. Hiram Lodge, a convicted felon. Ethel, as they do actually help her. Though now we have to ask who was following her and if it was (unfortunately) standard harassment or Black Hood-related. And if it’s Black Hood-related, what’s Ethel’s sin? Possibly Jughead, but just as a joke. 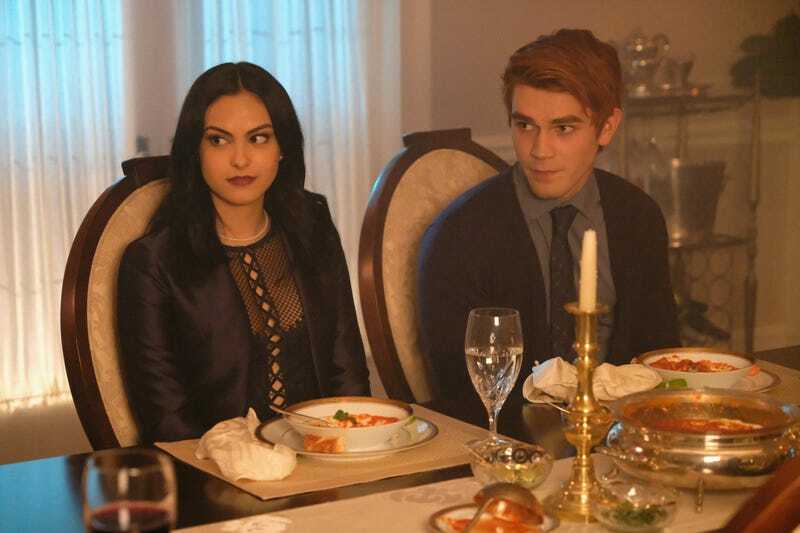 While this episode focuses a lot on Archie’s teen mob thing, sadly we’re deprived of the full potential of a standard awkward Riverdale dinner as a result of that focus. We get a scene where Veronica promises to teach him some common Spanish phrases for the dinner, yet not once do we hear him butcher a foreign language or learn that Veronica is short for Josephine. “Rum?… Like the alcohol?” is still pretty good though. But as Veronica spends a good chunk of her time making sure her father approves of her boyfriend and friends, she spends just as much time in a bizarre love triangle with her mother for said father’s affections and trust. While Veronica might not know it, she’s already kind of won. Hiram’s very much concerned with keeping his daughter in his good graces and with a belief that he’s a good guy, even though the latter isn’t the case. And any problems with the former aren’t exactly Hermione’s fault, as much as he believes they are. When Hiram threatens Hermione for even thinking to “poison” Veronica against him, it’s the result of a scene in which Veronica practically goads her mother into telling the truth about Hiram. Hermione doesn’t bite and is loyal to her husband, but even that’s not good enough for him. “Chapter Sixteen” continues to successfully plead the case for Hermione Lodge’s character transformation into “evil” Hermione, especially when her scenes with Veronica fill the void left by both an absent (and of course Cheryl-controlled) Penelope Blossom and an otherwise preoccupied Alice Cooper. While Alice may get the last word in her scene with Sheriff Keller and Mayor McCoy, she’s still rather subdued in this episode due to Polly’s decision to go to “the farm.” But Marisol Nichols picks up the slack, consistently surprising everyone with just how cold and petty she can play Hermione. She and Mark Consuelos are playing the most against type of the any of the parent characters, and it’s a joy to see. It’s also a reminder that Riverdale can continue to surprise even with its more familiar components. Even though Archie is completely consumed with safety in his community, it should of course be noted that that community doesn’t extend to the Southside. Although, if the Red Circle tried to pull their particular brand of jock justice on the Southside, the results would certainly be entertaining. Over on the Southside, we have Jughead finally back at his actual school, as the show hits the reset button again to pretend this is his first day of school. ** With Southside High Day One (take 2.0), we’re introduced to a new Jughead/Serpents dynamic, a rival gang called The Ghoulies, and a truly depressing depiction of an underprivileged high school. Jingle Jangle in the hallways, graffiti everywhere, defunct newspapers, and cliques separated by either their gang affiliation or cannibal status. It’s moments like these when I can’t believe that Riverdale is a television show that even exists for me to write about, and this is the same review in which I just wrote about the supporters of a small town teenage vigilante mob. As is the way of televised squalor, the scenes at Southside High are even darker blue than standard Riverdale. However, unlike the school’s introduction in season one, Jughead doesn’t have the easiest time at his new school this time around. It’s hard to say that anyone watching thought Jughead was really going to be able to fulfill his promise to Betty that he was going to stay out of the Serpent world, but “Chapter Sixteen” makes it clear that just when he thinks he’s out, they pull him back in. And this is just the result of being a legacy Serpent, not even being a full-fledged criminal. But while Archie thinks he’s helping solve crime in town, Jughead’s new surroundings lead him to continue to actually do so; he learns on just his first day that the hard drugs making their way to the Northside are courtesy of The Ghoulies. He also learns he can’t just keep using the Serpents as his personal favor service, too, but that’s not as easy to learn. “Chapter Sixteen” is the first episode of the season that truly feels like it’s picking back up where peak Riverdale season left off. And while it still leaves a lot of things untouched and unsaid, what it does touch and say is as good as it can be. (Somehow, Archie doesn’t have a real reaction to the reveal that he was right about the Black Hood and all the attacks being connected.) As Riverdale opens its world up more, it’s becoming even more preposterous that anyone ever thought it was a sweet, perfect town, but that’s part of the series’ charm. Not only does this episode provide a good showcase for two of its more difficult to nail characters (while Josie’s role is still a problem for the show, the show doesn’t really have a problem wiht the character itself), but it gets back into the forward momentum of the season. Funnily enough, it does so without actually having the Black Hood go after anyone, but with his motivation now out in the open, it also gives these characters more of a reason to act before it’s too late. As I’ve mentioned before, Riverdale still provides moments that serve as reminders of why it’s so enjoyable. But when it does them consistently from scene to scene, with everyone involved getting in on the fun, that’s when it works. “Chapter Sixteen” works. Riverdale Roulette: Technically it might not count as a teen genre piece of media, but I have to suggest Dangerous Minds this week. Specifically for the fact that Southside High School so very much needs someone to Dangerous Minds them. That or Take The Lead them, and I just don’t expect that from this show. Part of me wanted to suggest an episode of Finding Carter, in honor of Vanessa Morgan’s debut as Toni Topaz. But then I just get angry remembering how quickly that show went off the rails, even if Morgan’s character remained the most tolerable throughout, despite being named Bird. *I need to know that Riverdale knows it’s okay for Moose to be a closeted (if he must be closeted) bisexual guy and not just a closeted gay guy. His scene with Kevin is Moose’s best and most interesting scene, but even though he says he’s not sure Midge is the right person for him, that doesn’t and shouldn’t necessarily mean it’s simply because she’s a girl. It’s all right for Moose to be into Midge—and even if he’s not into Midge, at least other girls—as well as Kevin or any other guys. **While episode promos tend to play with the concept of the actual truth of the episodes, it’s the episode synopses and press releases for “Chapter Sixteen” that keep hitting “first day of school” with Jughead’s story. And the plot treats it as such. Will Riverdale go as predictable as possible with Betty/Jughead/Toni? Jughead already has some Serpent lady trouble with Penny Peabody, so he really does not need more. Though I do wonder if Jughead is going to react with the same amount of surprise every time he meets another female member of the Southside Serpents. Because it would actually be a pretty great recurring bit. Riverdale is the type of show where I think Jughead might just be a jerk loner calling a Serpent “sweet pea,” only to immediately accept, “Of course his ‘name’ is just Sweet Pea” when Toni also calls him that. This is a good show. That Kevin points out how untrustworthy dating apps while doing something that can be just as (or even more) dangerous straddles the line between ridiculous Riverdale comment and legitimate grievance. Because while Kevin’s right that he could easily be deceived by a false depiction from the dating app, he refuses to acknowledge how dangerous Riverdale itself is, even if you think you know someone. He at least realizes this in his last cruising attempt. Cheryl’s off on the sidelines encouraging risky teenage sexual acts in this episode… until she isn’t. Cheryl plays the role of sassy observer this episode, and while that’s still technically a good use of her time, it’s kind of a waste overall. She gives Betty a speech about Kevin’s issues stemming from ugly duckling turned beautiful swan status, but it turns out that’s not exactly the case. And really, if Cheryl didn’t call Betty, I feel like she would’ve ended up facilitating something extremely dangerous happening to Kevin. “Dark Betty” is great, but I don’t exactly feel the same way about characters just throwing out “Dark Betty” in conversation. Unless they’ve been confronted by (or witnessed said confrontation by) Betty in a black wig at any point. Now we’re back at square one when it comes to how the Black Hood knew where Grundy was, as his motives are based on her sins as opposed to a personal vendetta. So how did the Black Hood know where she was? How does the guy know about any of these people and their actions? Other than by listening to Jughead’s voice-over, that is. By the way, even the Black Hood knows Grundy’s a child predator. Will Archie ever realize that? That’s the greatest mystery of all. On that note, I will link to this Cosmopolitan article. I think the funniest thing about Archie’s battle cry against the Black Hood is that the guy doesn’t even see him as a target: Based on his criteria and letter, if anything, he sees Archie as a victim. So I imagine that either the Black Hood did not watch Archie’s YouTube video or he watched it with an amused look on his face (kind of like Hiram). An amazing shot in this episode: pensive Archie sitting in front of Veronica’s fire place, as though he’s a character meant to be taken seriously in any form. This is the same scene in which he says “us” when talking about the people who solved Jason’s murder. This is why his friends just let him go with his little militia; it’s something shiny to distract him. Sheriff Keller: “Did ya actually think I’d let a bunch of teenagers form a militia?” Yes, because you did. Also yes, because you continued to allow them to do so. Shirtless, even. Polly: “I’m an unwed mother, carrying my cousin’s babies. I am the poster child for sin, Betty.” First of all, it’s nice to see Polly get a win on her way out with that line. Second of all, how could Betty seriously say that Polly isn’t a sinner? No one’s saying Polly’s a bad person, but using the matter-of-fact definition of sin that this particular villain is using, yes, of course Polly is a sinner. Veronica: “I’m polishing cutlery, Mom.” Every day Veronica strays closer toward Hermione slapping her. Hermione: “Pobrecita. Poor little princess. The king will always keep her at arm’s length.” This is definitely a normal thing a good parent should say to their child. This episode is technically not as heavy on the Sabrina spin-off teasing, but it does still have a shout-out, specifically in the Red Circle stuff. Red Circle is not an Archie comics character, but it is the imprint that published the fantasy/horror (and later superhero) stories under that umbrella. Specifically Chilling Adventures In Sorcery As Told By Sabrina and the Black Hood comics. It truly must be the season of the witch. Everyone keeps comparing the Black Hood stuff to Zodiac, but I want it to be Riverdale’s Snowman. Make of that what you will. I do appreciate that Hiram’s “man-to-man” talk with Archie—as ominous as it first sounds—is just the standard respect talk. Telling him not to sneak into Veronica’s bedroom at night? It’s a valid request. Of course, it turns into Hiram pushing Archie more and more into teen vigilante justice, so that’s… different. Trying to unpack Hiram’s actions when it comes to Archie/Red Circle, is the point that Hiram wants to destroy Riverdale and remake it in his image? Because suggesting youths take over crime prevention is definitely key to the first half of that plan.